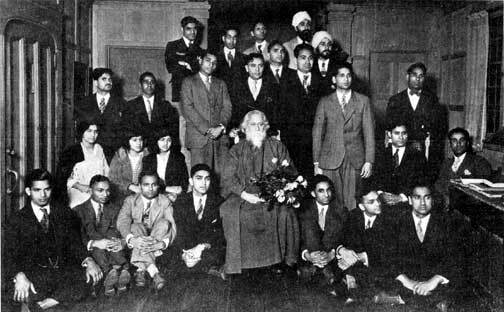 Responding to a query by Ramananda Chattopadhyay on this news article, Rabindranath gave a more detailed account regarding how he was protected by the police during those few days but he reiterated his trust on his countrymen. But this time he did mention that his speeches on Nationalism were not well received by some Indians in the audience and he did feel a strong sense of antagonism towards him. However, the fact remains that it can never be said for certain as to whether such a heinous plot was ever conceived or not. The story that is told in the play “Rajar Chithi” is based on the above incident but it should not be considered as history in any way. It is a work of pure fiction based on historical references. The characters are fictitious, but they are inspired by real characters of the period who were involved in the Nationalist movement. The inspiration for the character of Mary comes from several American woman of that time who actively helped the Indian freedom struggle. The play may seem to be a departure from the kind of plays we produce in ECTA, that is “to tell our stories through theater.” But to me, it is still “our story” – it is the story of our predecessors in this country who struggled not only for their survival, but also for the freedom of their homeland. The play does not try to pass any judgement on the policies and beliefs of the nationalist freedom fighters of India, or on the philosophy of Rabindranath Tagore regarding nationalism and universal humanism. The play only tries to depict the eternal conflict between indoctrinated dogma and conscience, between organized beliefs and common sense, between our brain and our heart – a conflict that is as relevant today as it was during the early part of the twentieth century or even earlier. And in this process the play makes us think once again about the great genius that was Rabindranath Tagore in a new light. This entry was posted in Generic and tagged Calcutta, earth, ECTA, heart, Hindu, history, India, Indian, information, IT, Krishna, party, Philosophy, play, policy, producers, Rabindranath, tagore, theater, train, USA by sudipta. Bookmark the permalink. Read a review of the play Rajar Chithi at http://bartamanpatrika.com/content/prabas.htm.